A startup based in Ballston is growing fast thanks in part to the rising success of mobile news companies. Users can download the company’s app and configure their preferences to see the kind of stories they like. 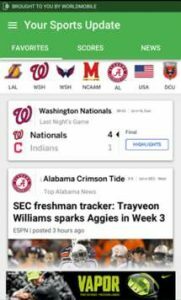 A typical user might sign up to see new sports scores, news, horoscopes, trivia, weather and other conent on their phone’s home screen. The company plugs into ad networks and uses ad exchanges to monetize the service. Millions of people currently get updates from Mobile Posse, meaning lots of potential revenue, Jackson said. Last year, Mobile Posse expanded its total revenue by about 77 percent, Jackson said. It’s also hiring at a quickening pace. Though the company only moved into its Ballston offices less than two years ago, it’s already looking for a newer, bigger space to hold all of its new employees. And, if all goes according to plan, Mobile Posse will continue to grow rapidly in the year ahead.